After last week’s “road trip in the rain”, seeking out some of Vancouver’s best chocolate covered fleur de sel caramels, I am hooked. And once I have rehydrated myself, and my well-salted taste buds have recovered, I have to try making them, myself. My first attempt is at a firm caramel, recipe found here. Canadian Living magazine is one of my “comfort food” things. Always reminds me of Mum, as she bought me a subscription, every year. 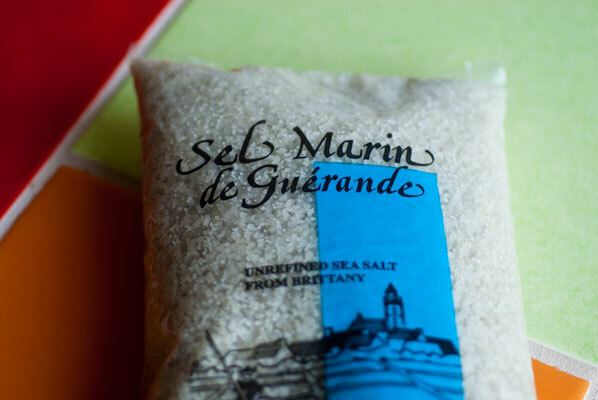 I am excited to open my Sel Marin de Guerande. I got so excited when I tracked it down, I felt like a kid in an ice cream shop, and I ended up purchasing not only the fleur de sel needed for the caramels, but also a bag of sel gris with its “clay particles and the smell and flavour of Dunallella-Salina seaweed”. You are certainly not going to experience that in a box of iodized table salt, and I can’t wait to try it on something savoury, perhaps my favourite oven-baked fries recipe. But I digress. 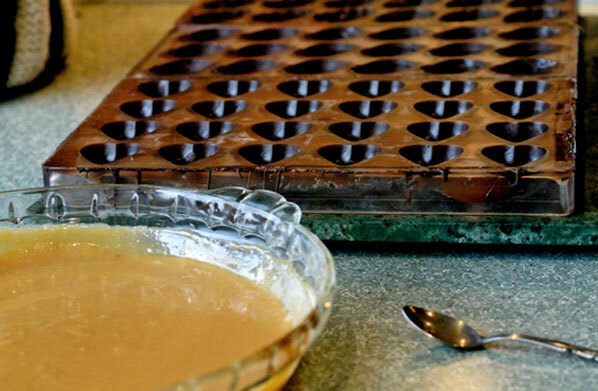 The caramels set up well, and I score them before they are completely firm, to enable cutting them later. Perhaps I cooked these a little longer than necessary, or perhaps I didn’t expect them to be quite so firm. They are tasty, but very hard. These are the kind of old-fashioned caramels kids were given in days gone by, for long car rides, to keep their mouths occupied, to stave off the querulous “Are we there, yet?”, and before braces and fillings became such an issue. The good news is, they are very easy to dip, and soon, I have a large batch of ‘em, decorated with tiny flecks of fleur de sel. 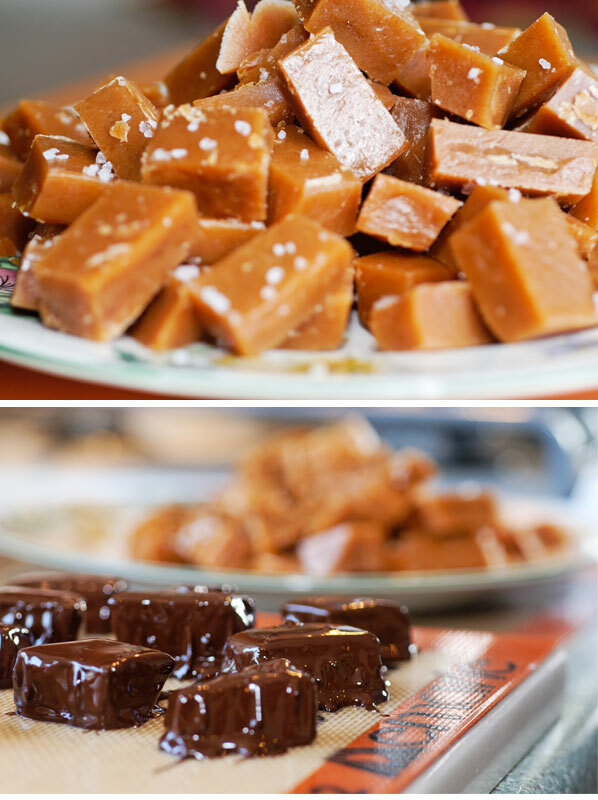 The family and the boys’ friends like the taste: buttery and creamy, and are willing sit with a mouth full of salt, chocolate and caramel while the squares melt, but I am after something else. 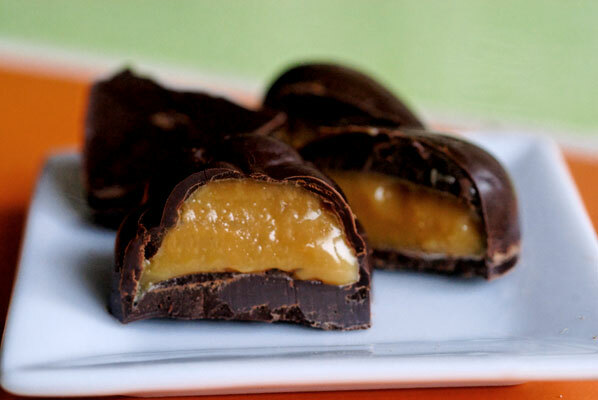 I crave a smooth, thin chocolate shell, hiding a flowing caramel centre. I am currently working with a wonderful group of teen actors, and we are in final rehearsals for our end-of-year play. They have been such good sports all year, happily taste-testing some of my more questionable creations, as I attempt to create signature chocolates for my Ecole Chocolat homework . 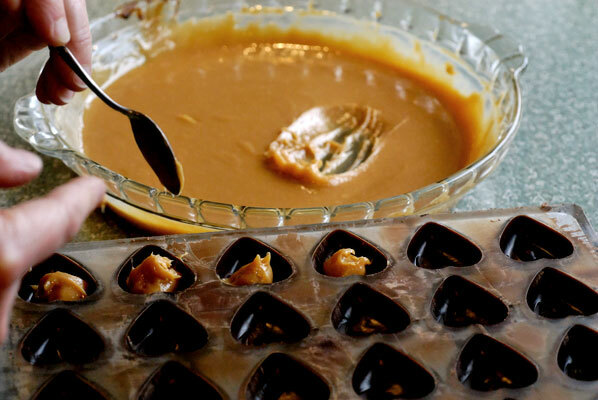 One of the students is from Argentina, and has sweetly suggested, on more than one occasion, that dulce de leche is the most perfect food in the world, and would, perhaps, make a lovely centre for chocolates. It turns out to be exactly the flowing caramel centre I am looking for, when a soupcon of Sel Marin de Guerande is added. “a thick, caramel-like milk-based sauce or spread. They go on to say that dulce de leche is often made at home by boiling an unopened can of sweetened condensed milk for 3-4 hours, or else cooked in a pressure cooker. As these cans can explode if not carefully watched, I do not think I will risk this method! 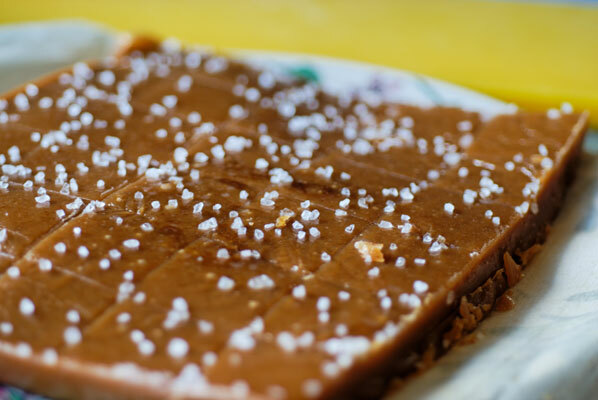 Fortunately, I am able to find a simple, but much more controlled recipe for dulce de leche, thanks to my new favourite foodie (I really want his life, for a week): David Lebovitz. His recipe for homemade dulce de leche is straightforward and carefully controlled, cooked for 75 minutes in a 350 degreee F. oven, in a bain marie to ensure it does not burn, and enables me to add my sel marin to taste. While this is in the oven, I temper and mold some bittersweet chocolate shells. I must be feeling more comfortable with this process now, than when I started the course, due to practice, practice, practice (and several disasters). I have my set up down to a fine art, and since I keep everything I need (candy thermometer, scrapers, marble slab, oversized metal bowl, silicon spatula strictly dedicated to chocolate, even the moisture-catching cloths) together in a plastic tub, and away from everything else in the kitchen, it’s a quick preparation. I even like chopping chocolate, now, although I have never again attempted to use the chipper, after my first injury! Upon taking the pan from the oven, I lift the foil covering, and give the contents a good whisking. The resulting light brown caramel sauce is so good, eaten straight off the whisk, it takes every ounce of will not to get out a big spoon and eat the whole thing. Instead, I put it in the refrigerator to cool, as I wait for the distinctive cracking noise of the chocolate shells pulling away from the sides of the molds. After having the opportunity to watch the technique of seasoned professionals filling chocolates, at Moonstruck, and at some of the local shops we visited last week, I am determined not to overfill these. 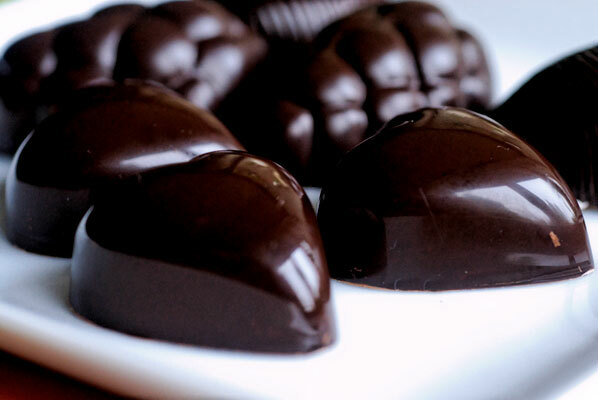 I have had a few disappointments with too much of a good thing in my molds, which makes it impossible to get a good, solid backing coat, and consequently, makes for very messy unmolding, and unsightly undersides of the chocolates. Chilling the dulce de leche helps here, as I can scoop it up with two tiny spoons and sort of roll a ball of it into the cavities. The backing coat goes on without any filling seeping through, and I am thrilled. I did pop the molds in the freezer for five minutes, before attempting to unmold, and eased/bent the sides ever so slightly back and forth between my hands as soon as I took them from the freezer, and this worked well. A vigorous shake, and 24 glossy dark hearts popped out onto the slab. These molds are definitely my favourites, as there are fewer crevices for the chocolate to “catch”, than in the more intricate designs. But, they unmold as well. This is a good day! They are absolutely delicious. Smooth, rich, the filling flowing out over the chocolate shell as you bite into it (my shells are not too thick: a small success!) Just a tiny hint of fleur de sel in the caramelly taste, enough to temper the sweetness, but not actually impart a salty taste. This one is definitely a keeper. I am so pleased with them, I feel terrible having to limit my family to one each. Fortunately, they are so rich, one is very satisfying. The rest of them are carefully boxed, and secreted away in my bag, ready to make their Opening Night appearance, as a gift for my teen actors. And I think I am in agreement with my very wise student actor: Dulce de Leche is just about the most perfect food in the world.